↑ Potterfield, Peter; Viesturs, Ed; Breashears, David (2009). 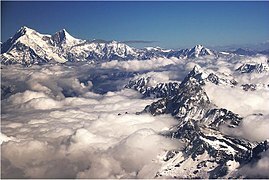 Himalayan Quest: Ed Viesturs Summits All Fourteen 8,000-Meter Giants. National Geographic. p.137 আইএসবিএন ১-৪২৬২-০৪৮৫-X. ↑ Spelled "Shisha Pangma" in Messner, Reinhold (1999). All 14 eight-thousanders. Mountaineers Books. p.105. আইএসবিএন ০-৮৯৮৮৬-৬৬০-X. ↑ Carter, H. Adams (1985). "Classification of the Himalaya" (PDF). American Alpine Journal. American Alpine Club. 27 (59): 122–3.